Hi guys, you may have noticed the quail related links I've added recently, well...I've been thinking of getting some quail! Coo's not keen and that's the only thing that has stopped me taking the plunge...yet! I bought it a few years ago as I had two rabbits who needed a bit more space and sadly, it's been lying empty for over a year. Well, I painted it a tasty chocolate colour and got it all ready, researched(properly!) 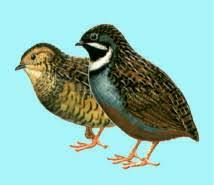 how to keep quail and found a breeder not too far away so I thought I was home and dry on the quail front but not so! The usually mild and easy going Coo has kinda scuppered the plans as he doesn't want me to get them! It's so unlike him as usually he's a pretty much go-with-the-flow kinda guy but he seems to be digging his heels in this time. I'm still working on Coo but something tells me it's not going to be so easy! I wonder what he has against these pretty little birds?? I'm still hopefull of changing his mind - wish me luck!